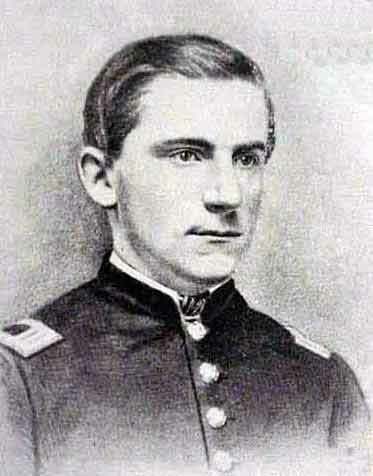 George Davis won the Medal of Honor at the 1864 battle of Monocacy. The battle of Monocacy was a desperate fight to delay Jubal Early's force advancing on a virtually undefended Washington, D.C. When rumors of the advance of a Confederate force reached Grant, he was persuaded to detached Richett's division of the 6th Corps and send them to reinforce Harper's Ferry. Part of his command reached Monocacy in time to assist a mixed group of mostly untested soldiers assembled by General Lew Wallace. 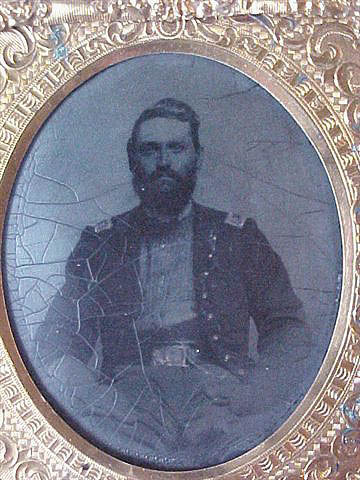 Among these 6th Corps veterans was First Lieutenant George Davis and the 10th Vermont. Davis energetically conducted a defense of his area of line using both his own and untried soldiers against a Confederate force that attacked in overwhelming numbers. In the end the battle was lost, but Wallace's small command served as an effective speed bump to Early's advance and the Capital was saved when additional reinforcements reached it. For his part George Davis won the Medal of Honor. Davis' shoulder strap is a double bordered non-regulation type that was very popular during the Civil War. The field is medium blue velvet and is a somewhat deeper shade than the common light blue found on the average infantry insignia. The most interesting feature of this strap is the extra wide gold lieutenant's bars. Commonly bars on double bordered straps are also doubled. People inexperienced with shoulder straps often assume that a doubled first lieutenant's grade device is that of a captain. The embroiderer of Davis' strap rather than doing this made an extra large bar that corresponds with the wide double border. Davis' corps badge is a metallic private purchase type often worn by officers. Badges were worn on the top of the forage cap, right side of the Jeff Davis hat and over the left breast of the uniform coat. The badge has a blue colored insert, indicating the third division of the corps. The back in fitted with a pin to allow its attachment. The badge of the Sixth Corps was adopted March 21, 1863. "We now wear a red cross upon our caps and and hats. 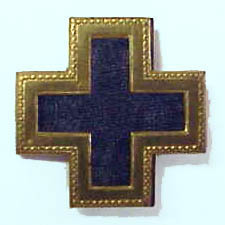 The Greek cross is the badge of the 6th Corps. The first Division wears red, the second white and the third blue."